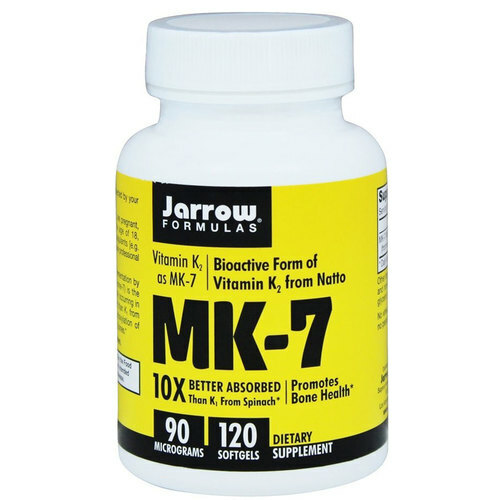 MK-7 from Jarrow Formulas contains a limited blend of ingredients that are free of some common allergens. Warnings: If you have a medical condition, are pregnant, lactating, trying to conceive, under the age of 18, or taking medications consult your healthcare professional before using this product. Do not take more than recommended dosage. Do not use if safety seal is broken or missing. Notes: Wheat Free. Gluten Free. Dairy Free. Egg Free. Fish Free. Shellfish Free. Peanuts Free. Tree Nuts Free. Recommended Use: Take 1 softgel per day or as directed by your qualified healthcare professional. The customer reviews posted below are based on individual consumer experiences and may NOT necessarily represent what expected results will be from using or taking Jarrow Formulas MK-7 - 90 mcg - 120 Softgels. These results may not be typical and you should not necessarily expect to receive the same results. Actual results may vary. Very good and important supplement for our organism. I like the Jarrow brand, it's reliable and super-recommend.